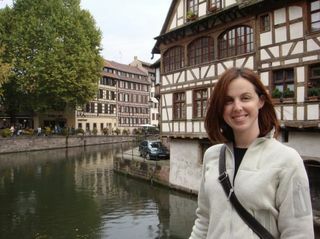 She Loves the Half-Timbered Buildings in Strasbourg! Three weeks ago, I'd never heard of Strasbourg, France , but as of tonight, I feel like I've seen every corner of the city! After taking the red-eye from SFO to Frankfurt, arriving this morning, Jon and I picked up our rental car (a little, black Mercedes which isn't quite as perfect as the car we rented last year... Jon's bummed that it doesn't take Diesel... but it's still darling!) and wasted no time getting on the road. Last year we headed West to Luxembourg and Belgium, eventually heading North to Denmark. This year, we left Frankfurt heading Southbound on A5. Our final destination is Zurich, Switzerland! But we decided a few weeks ago that we should swerve slightly Westward and stay the night in France, too, another country neither of us have visited before. 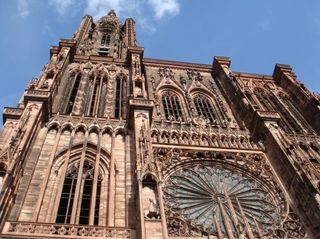 Strasbourg, capital of the Alsace region of France, has as its most major landmark a giant Gothic cathedral at its center. Approaching the city from the North, we came over a rise and could immediately see the striking, massive steeple of the Strasbourg Cathedral piercing the cheery blue sky. The cathedral remains to be the fourth tallest church in the world at 142 meters. Attempting to take pictures of the structure was a challenge, but we found that odd angles did the building the most justice. Good news! Driving in Strasbourg is easier that driving in Brussels, but just barely. While the streets don't curve or change names nearly as often, there are so many one-ways and dead ends that we found ourselves looping in concentric circles, spiraling towards our hotel (the Best Western de France... don't laugh, it's in the heart of the city and the folks here are very helpful!). Thanks to my three years of high school French, while I remain sadly unconversational, I was able to help Jon navigate Rue Mercière, Rue des Dentelles, Rue du Bain aux Plantes, Rue des Juifs, Rue des Frères, Rue des Tonneliers, Rue du Maroquin, Rue des Charpentiers, Rue des Serruriers, Grand' Rue, Quai des Bateliers, Quai Saint-Nicolas and Quai Saint-Thomas. Haha! Eventually we found the hotel, though we were forced to park several blocks away. The parking garage we found was narrow, full of steep ramps, tight twists and petite parking stalls--exactly like the nightmare garages we used last year in Luxembourg City, Copenhagen and Brussels. And leaving the garage, the lift (Americans read: elevator), incredibly, was correspondingly tiny. Jonathan and I, tiny people, and our luggage could barely squeeze into the cramped, dark, squeaky box. Yes, I hyperventilated. Yes, we lived through it. 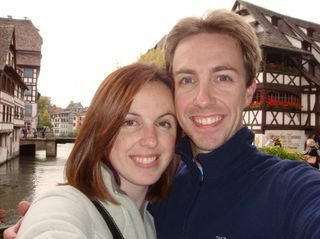 After a quick nap in our room (I couldn't keep my eyes open having been awake for almost 24 hours straight), we grabbed our camera and hit the cobbled streets of Strasbourg. Lunch was job number one. We randomly chose one of a zillion little brasseries and ordered sandwiches. My mayo was spiked with some unrecognizable spice, but I dealt with it. Jon's sandwich had the most flavorful Swiss cheese we'd ever tasted. We walked through dozens of little squares, lined with porcelain shops and souvenir stalls, filled with happy, bustling people. One housed a large, spinning carousal; from afar it was nothing but a swirl of pastels and white lights. Children giggled and waved to parents brandishing hefty cameras. The weather was perfect. Mid-sixties and sunny. We circumscribed the cathedral, popped into a store to pick up a magnet (our refrigerator is like a giant scrapbook! ), nibbled on a large pretzel, enjoyed the rhythm of our own steps on the cobbles. My favorite part of the city is Petite France, a small quarter boasting the darling half-timbered houses with bright, floral planter boxes which faces the Ill River. As Jon snapped photos of the scenery, I was captivated by the people strolling along the banks and between the heavy, stone structures. There was a woman pushing a stroller; it was her fire engine red high-heeled pumps clicking on the street which kept my attention. Groups of university students moved in packs from place to place, singing and tackling one another. Mothers held the hands of their children when retrieving them from school. Delicately featured young men, carelessly wrapped in open, flapping trench coats and skinny, striped scarves, alternately smoked and spoke as they passed us. An elderly gentleman hobbled at an agonizingly slow, hampered pace across a bridge, clutching a pastry in a white bag. We'll sleep well tonight, exhausted by traveling and by the sheer volume of culture and change we absorbed in France today. Tomorrow we'll be off to Zurich. But I think a piece of my heart will remain at the oddly angled intersections of the stony roads of Strasbourg. 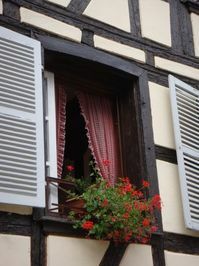 Tonight, my happiness is as bright as the red and pink flowers edging the windows in Petite France. She Loves the Languages in Zurich!